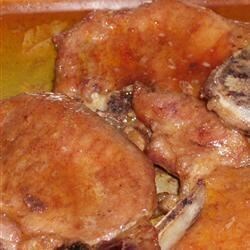 "Sweet glazed pork chops go well with bread dressing- no gravy required!" In a small skillet melt 1/2 tablespoon butter or margarine. Add onion and celery and saute until translucent. Add saute mixture to a large bowl with bread, Greek seasoning and broth. Mix to coat bread evenly, not too soggy. Spread bread mixture/stuffing in the bottom of a lightly greased 9x13 inch baking dish. Top with pork chops; if desired, sprinkle chops with additional Greek seasoning. In a medium bowl combine the brown sugar and melted butter or margarine and mix together. Brush mixture over the tops of the pork chops and drizzle over chops and stuffing, allowing some to seep into the stuffing. Bake in the preheated oven for about 30 minutes or until internal temperature of the pork has reached 145 degrees F (63 degrees C). Baking time will vary slightly depending on thickness of chops. If desired, baste with additional butter/sugar mixture while baking. Serve by dishing chops out of the baking dish, including stuffing. Enjoy! I enjoyed this but my husband did not like the stuffing. He thinks it was the brown sugar. Oh well. This tasted good, but....we noticed that the stuffing under the chops was a bit mushy. Next time, I'd separate them. Otherwise, well done! This recipe was really good. I just did mine with butter, soy sauce, and brown sugar. It still came out REALLY good and everyone loved it. Even my 7yr old son who eats NOTHING! Way too sweet (and I love sweet!) even my kids thought it was too sweet. Other than that not too bad.